Ecuador is a great place to enjoy the proximity to this wonderfull animals. 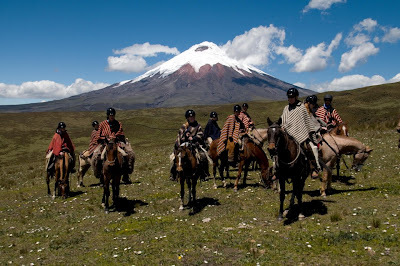 We have in our country several races of horses and the well known "Criollo de Páramo", a small sturdy horse capable of withstanding the hard nature of the ecuadorian Andes. Come and enjoy in one of our haciendas, the coast and even the Rainforest a great ride. You can select your route and riding time. Upon that we determine the grading of a ride. CLICK HERE to see the image gallery from this page.